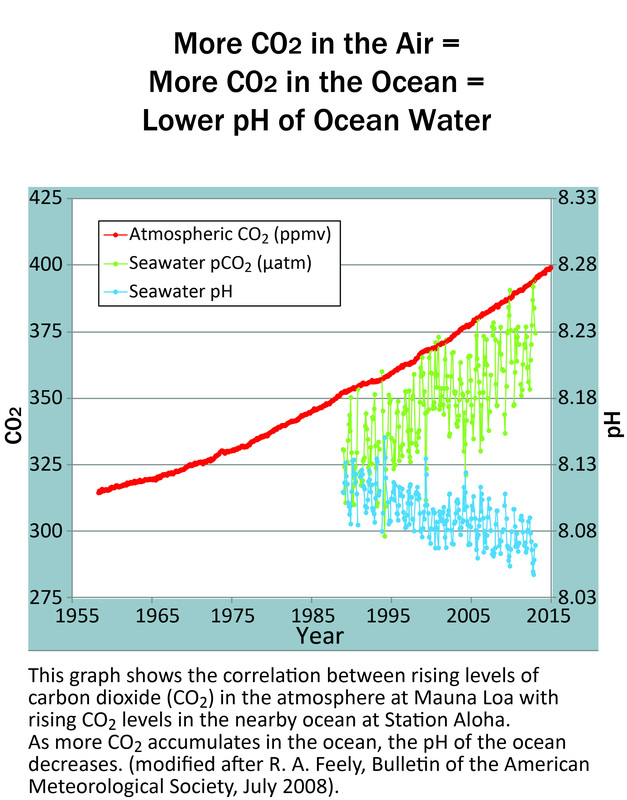 Ocean acidification is a term used to describe a major shift in the chemistry of the ocean caused by sharp increases in carbon dioxide in the global atmosphere. A portion of this carbon dioxide is absorbed by ocean waters. This does not mean that the ocean is turning into an "acid." It does however mean that the ocean is becoming more acidicin other words the pH level of seawater is becoming lower and moving closer to the acid end of the scale. Ocean acidification happens when carbon dioxide reacts with water to form carbonic acid. The rate of ocean acidification has increased as humans continue to release rampant levels of carbon dioxide through the burning of fossil fuels like oil, coal, and natural gas. In spring of 2013, the atmospheric concentration of carbon dioxide reached 400 parts per million, higher than the earth had seen in more than 800,000 years. In 2017 we passed 410 parts per million. Since people started burning fossil fuels during the Industrial Revolution, the global average pH of the surface ocean has decreased by 0.11 pH units, which is a 30% increase in acidity. If carbon emissions are not reduced, by the end of the century ocean pH is predicted to be lower than the earth has seen in 20 million years. What does this mean? The ocean acts as a carbon "sink," buffering our atmosphere from what would otherwise be much higher concentrations of carbon dioxide. 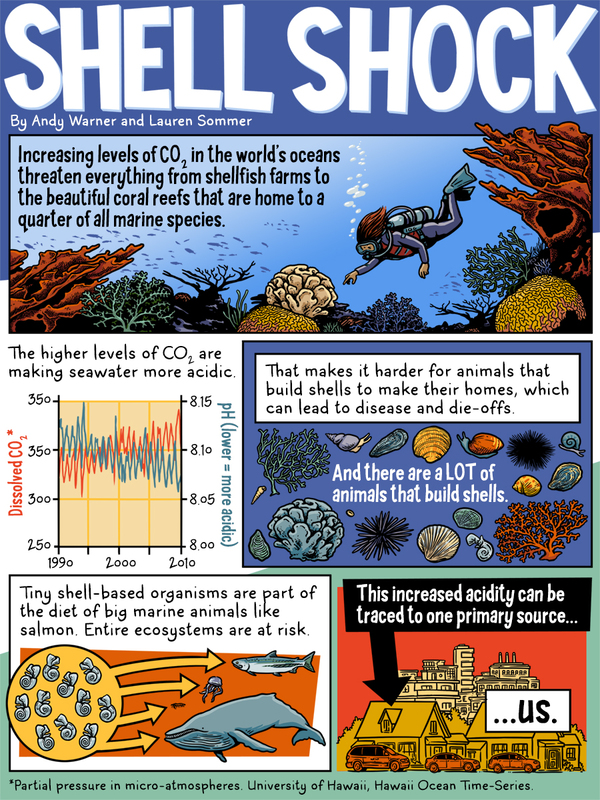 While this phenomenon means we're experiencing lower atmospheric CO2 than we would without the ocean, the consequence is the increase in ocean acidity. The rate of change in ocean pH is so much greater than what the earth has historically seen, some marine organisms will not adapt to their new environment. Calcifying organisms, such as shellfish and corals, are particularly vulnerable to ocean acidification, which impedes the ability of these organisms to produce and maintain their shells. Some negative impacts have already been documented, such as farmed oyster larva in the Pacific Northwest unable to form shells during low pH events. Laboratory experiments show that elevated carbon dioxide alters clownfish behavior, making them potentially more vulnerable to predators. Coral reefs, already impacted by rising ocean temperatures, are greatly threatened by ocean acidification. This infographic summarizes what is known about the impact of ocean acidification on specific California marine species. How do we address this problem? The ultimate answer is to reduce our carbon dioxide emissions. Get involved in your community to support decisions that help fight ocean acidification. Talk to your family, neighbors, and elected officials about ways we can reduce fossil fuel use on a community or government level and how we can make it easier for individuals to consume less. (In 2018, the State of California passed the 100 Percent Clean Energy Act, calling for 100 percent of total retail sales of electricity in California to come from eligible renewable energy and zero-carbon resources before 2046.) On a personal level, commit to conserving energy wherever possible. Walk, bike, ride public transit, and carpool instead of driving alone. Reduce your waste by thinking before you buy something. Conserve electricity, gas, and water (which takes energy to heat, pump, and treat) at home and work. Eat less meat, since livestock farming produces high amounts of greenhouse gases. And help the ocean cope by reducing other pressures on marine organisms by consuming only seafood that has been fished or farmed sustainably, picking up trash in your neighborhood and at the beach, practicing smart use of pesticides and fertilizers, and cleaning up after pets. Research is ongoing to study how marine organisms such as seagrass and kelp locally reduce dissolved CO2, so protecting and restoring these coastal habitats may be an important tool in dealing with ocean acidification. 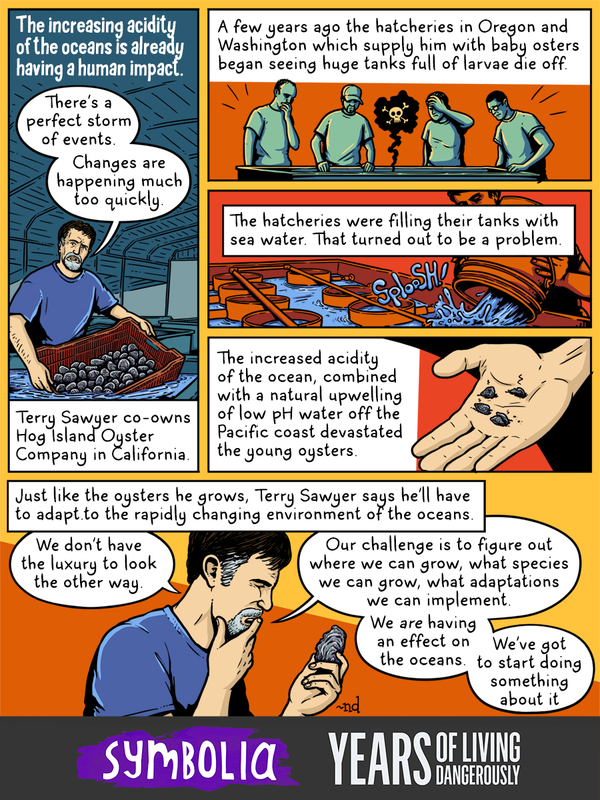 This comic was co-produced by Years of Living Dangerously, a SHOWTIME climate change documentary series, and Symbolia, a magazine where "comics and journalism meet." Find more information at symboliamag.com and yearsoflivingdangerously.com.